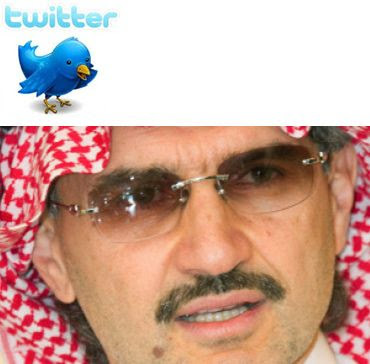 Saudi billionaire Prince Alwaleed bin Talal says he and his investment company are investing a combined $300 million into the microblogging site Twitter. Alwaleed said Monday the joint investment with his Kingdom Holding Company represents an interest in investing "in promising, high-growth businesses with a global impact." Alwaleed's KHC is a major shareholder in Citigroup and holds stakes in other large stakes in other western giants, including Apple and Rupert Murdoch's News Corporation.